Book 2 of the Epic of Gondwane, the tale of Ganelon Silvermane! What ho, faithful companions! Fetch yourselves nigh to my heaving bosom, my bated breath, my excitement-tautened sinews, as I whisper the thrilling tale of the Construct, brought to quickening by the unfathomable will of the unknowable gods in the mist-shrouded halls of the future! He is Ganelon Silvermane, wielder of the Silver Sword, boon companion of the Illusionist of Nerelon and of Xarda, the Knightrix of Jemmerdy: together they will escape the mad city of Chx, defeat the grotesque Death Dwarves, the anti-life minions of the titular (pun intended) Red Enchantress, whose luxurious and tempting clutches they will slip through – only to find themselves in ever-greater peril! Zounds! What will come next?! The best thing about this book, and the first one in the series, is that it’s all written pretty much like that. Breathless purple prose, ultimate pulp fiction. I thought there were some moments in this one where Carter slipped a little; he tried to make Xarda speak in even more archaic knight-errant language, but it didn’t really seem any different from his own narration, and so her self-conscious noticing of her own odd speech seemed – well, odd. There were also a few places where he crossed the line between fantasy and modernist fiction: he has a character, an ancient dragon who has existed (and hoarded treasure) since the dawn of time, reference some of the great swords of fantasy books past, including Orcrist and Sting and Anduril, and the twin swords Stormbringer and Mournblade; this was cool in that I know the books those swords came from – and a little weird in that the character in the book I was reading knew the books those came from, which felt off. But then the dragon also references ancient tales like Beowulf and the Ring Cycle, and the Bible’s Garden of Eden, and I thought: well, if the Bible can be part of ancient lore, why not Tolkien and Moorcock? So it wasn’t too bad. But it did jar a bit. On the plus side: lots of action, lots of swashbuckling and derring-do, lots of bizarre names (Carter’s specialty, I think) and weird creatures and strange societies. Carter had a fertile imagination, and he chucks it all over the place in this book. 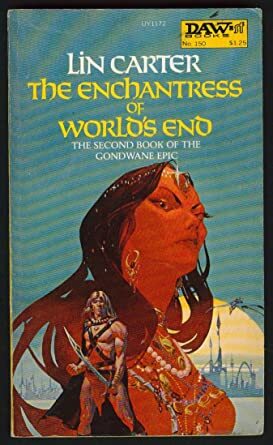 There is an absolutely hilarious chapter when the Red Enchantress, a buxom seductress of the first order, attempts to tantalize Ganelon with her wiles; unfortunately, while Ganelon has the perfect physique of a god, he has the mentality of a bright 8-year-old, so the Enchantress’s wiles fail entirely to wile him, to her murderous frustration. There are definitely some silly parts – the Bazonga-bird, a goofy idea with a goofy name and a goofy character, springs nimbly to mind, and drags with her parallels to Jar-Jar Binks and, I dunno, Carol Burnett – and some moments of questionable writing; but it’s a fun book, just like the first one. I’ll read the next, too.